Protect your trees and shrubs from deer and other animals. Ross® deer netting will drape easily over trees or can be used to create a netting fence to keep pesky animals from making a meal of your plants. 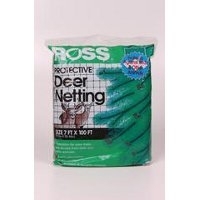 Lightweight and easy to handle, deer netting can be cut with scissors. The UV-protected plastic mesh will not rust or rot and is durable enough to reuse season after season. Tension Bar for Chain Link Fencing. *Chain Link is Only Stocked at the Owego Store. Please Call Ahead to Check Availability. Chain Link Fence Top rail with swedged end. 1-3/8"OD--18 Gauge. 10.5 Feet Tall. *Chain Link is Only Stocked at the Owego Store. Please Call to Check Availability. Joins the lengths of top rail. *Chain Link is Only Stocked at the Owego Store. Please Call Ahead for Availability. Post Hinge for Chain Link Fencing. For Chain Link Fencing. 2-3/8"OD. 17 Gauge Metal. 6 Foot Tall. This Hardware set can be used with Drive Thru Gate #96336101 in Our Catalog. This Can be Used with Walk Thru Gate #96335954 in Our Catalog. Fork & Collar for Chain Link Fencing. Heavy-Duty, 2-3/8" Wide, Aluminum DC Cap. 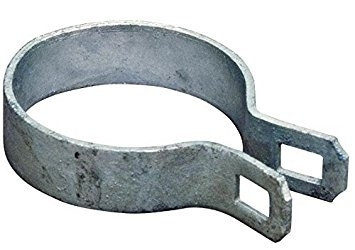 This is meant to be used for Chain Link Fencing Terminal Posts connecting to the Top Rail. Galvanized Steel. Includes Nuts. This Bolt is 3/8" Coarse Thread & 3 Inches Long. *Chain Link is Only Available at the Owego Store. Galvanized Steel & Includes the nut. Regular Brace Band for Chain Link Fencing. 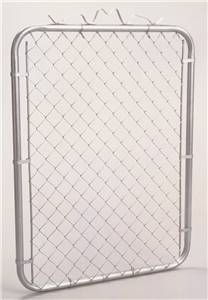 For use with Chain Link Fencing. Install the 'tie wires' onto the top rail first to estabilish height of the fence. Space wires evenly so they are no more than 2 Feet apart. Tie line posts last & Use the same number of tie wires per line post as tension bands per terminal @ a minimum of 1 per foot. This Chain Link Drive Thru Gate is 10' Wide x 48" High. It consists of 2 Panels & Features an EZ Latch Assembly. Machine formed 1-3/8" Tubing is then Covered with Galvanized Steel Chain Link. This Walk Thru Gate is constructed of Strong, Galvanized Steel. It is 48" Tall and Opens to 39 Inches. Machine formed 1-3/8" tubing is then covered with galvanized chain link. The silver-metallic color matches most chain link fences. This Can be Used with Walk Thru Gate Hardware #96335442 in Our Catalog. Don't let rust eat into your long term fence investment. Make a wise investment with Rangemaster's Chain Link. The one that gives protection to your home, animals and garden. This multi-purpose wire ais great for using when dividing sidelines, warehouses, or for security reasons.